Last weekend was a busy weekend for our family. On Saturday we went to an open house and Gideon's 1st birthday. On Sunday we attended Gideon's baptism. It was a busy weekend for Gideon too. The baptism was a very nice affair however Mom almost missed it. Earlier before the service started we got to the church early to drop Alyce off at the nursery so she could get use to it and the caretakers before we had to leave her. We thought that after 20 minutes or so she seemed well enough to leave alone. 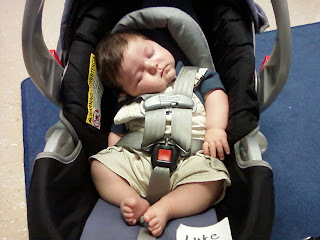 We had Luke with us in the sanctuary and he was more than content sleeping throughout the entire service. Right before the baptism was about t0 start the nursery attendant found us and told us that Alyce's wheels had fallen off. The wheels term is one we use when she just loses control starts crying and needs a Mom or Dad to get her back to normal and put the wheels back on. So Mom leaves the service with Luke to take care of Alyce because I needed to stay and video the ceremony. I thought Mom had missed the ceremony but thankfully they watched and heard it through a window in the cry room. Mom stayed with Alyce the rest of the service and appears to have had a good time doing it. 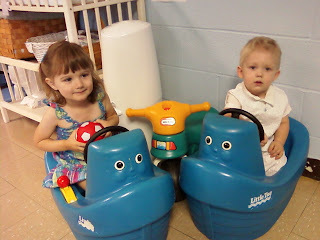 Later on even Gideon decided to join in on the fun in the nursery. After the service everyone was visiting outside the sanctuary and the weather was really nice. Since the family was well dressed and color coordinated we decided to get a family picture taken with the church's grounds being the backdrop. Of course our usually smiling cheerful 2 year old wouldn't smile for the camera but that is the way things are sometimes. 0 comments on "Gideon's Baptism and Family Pictures"